I can’t comment too much on the packaging for the GeekVape Nova, as the black box I received is most likely an early version designed specifically for reviewers. 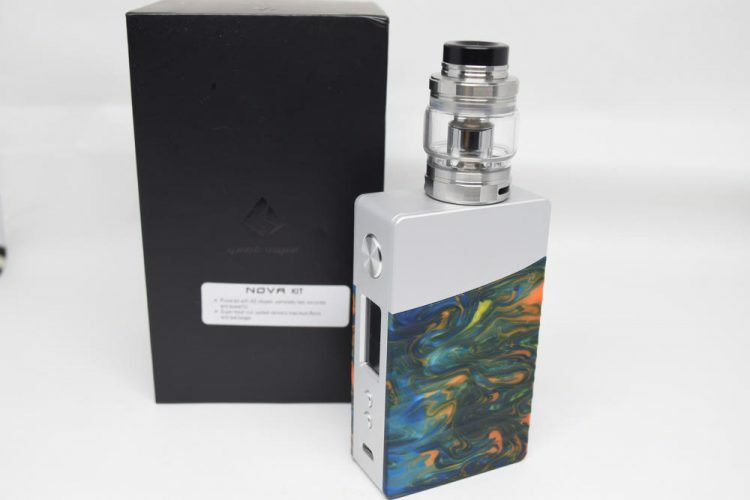 It’s basically a plain black rectangular box, with a small GeekVape logo and a tiny white sticker that just says ‘Nova Kit’. The final version will undoubtedly have a different look and feature a list of contents, company information as well as all the required warnings. Inside the box, we have the Nova 200W box mod sitting in a Styrofoam holder, and underneath that we have the Cerberus sub-ohm tank and a bag of accessories – a micro-USB charging cable for the mod, a spare glass section, several o-rings as well as an extra coil-head, for the tank, and user manuals for both the mod and the tank. 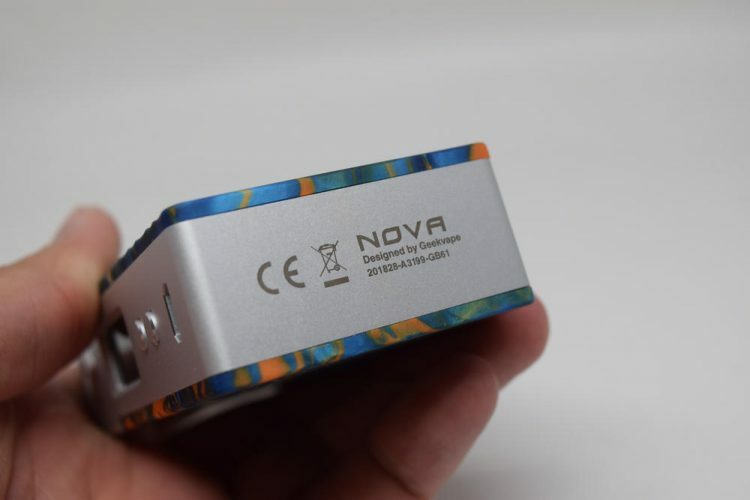 The GeekVape Nova features a classic, some would even call it vintage, box mod design. It’a rectangular device with only slightly beveled corners and edges and controls located on one of the narrow sides. 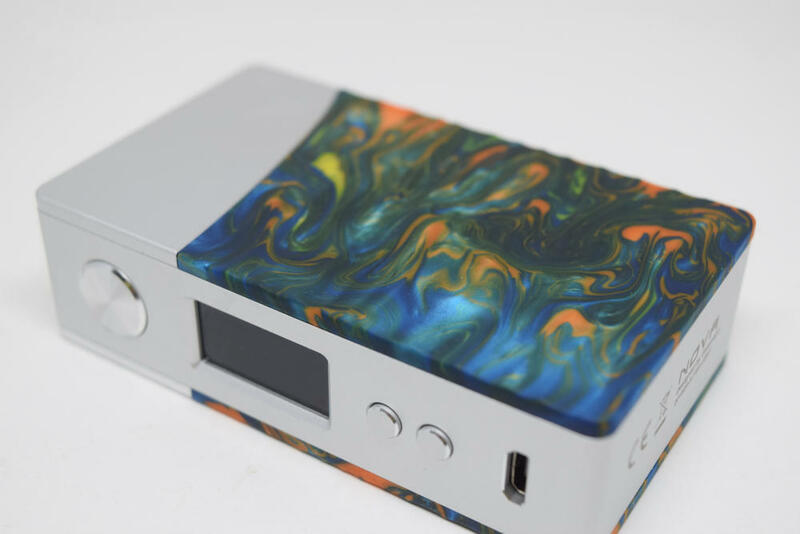 In many ways, it is very similar to the VooPoo Drag. The dimensions are almost exactly the same, they have the exact same button configuration and similar displays, and they both feature resin panels. 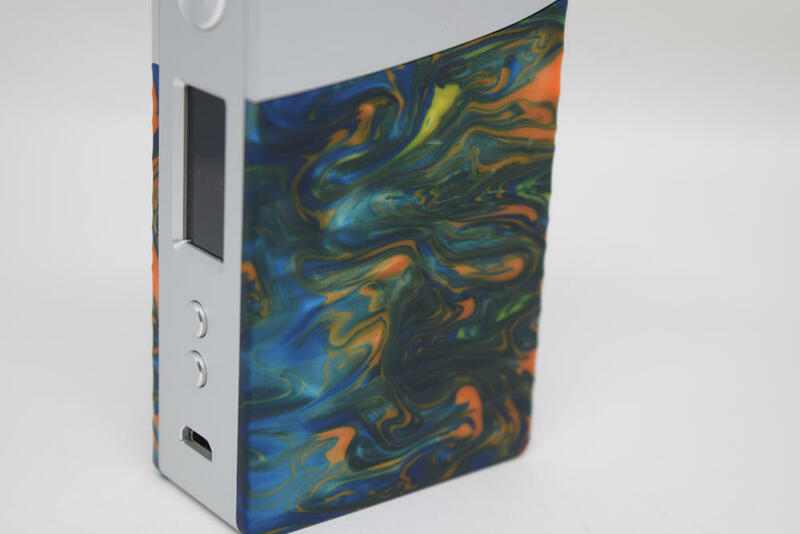 So did GeekVape use the Drag as an inspiration for its new Nova mod? They don’t say, and we can only speculate, but the two mods are indeed very similar. Like the Drag, the GeekVape Nova isn’t exactly the most ergonomic dual 18650 battery mod money can buy. It’s beveled edges don’t really dig into the palm of your hand while you’re holding it, but the mod isn’t nearly as comfortable in the hand as other dual-battery devices, like the Smoant Charon Mini or the Eleaf Lexicon, to name just a couple that I reviewed recently. 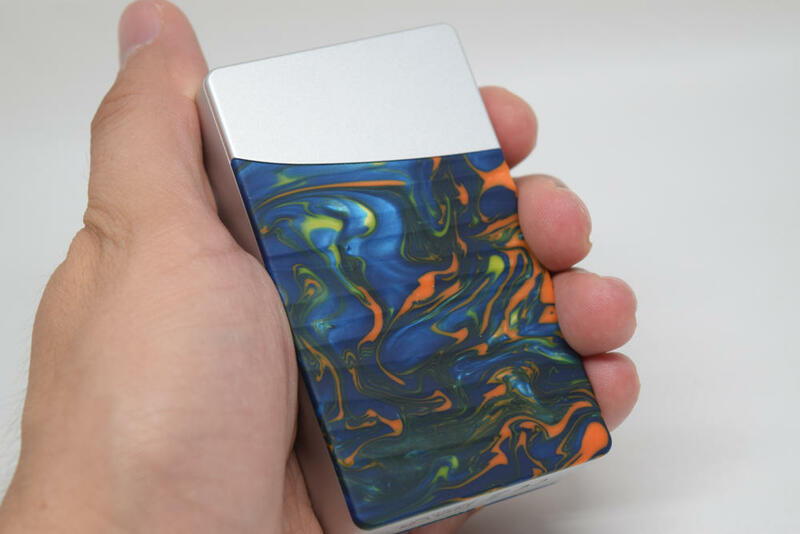 If you’re a fan of the classic box mod look, you’ll probably love it, but if you’re more into compact, rounded vape mods, it may not be for you. Starting from the top, we have a simple 510 connection located near the center of the mod, with a weird oval-shaped plate around it. I don’t really get why they put the 510 there instead of dead in the center of the mod, or to the side, since the Nova is just 25mm wide, so any atomizer with larger diameter than 25mm will overhang anyway. As for the shape of the plate, I for one just think it looks awkward. On the sides of this mod we have a combination of resin and metal. 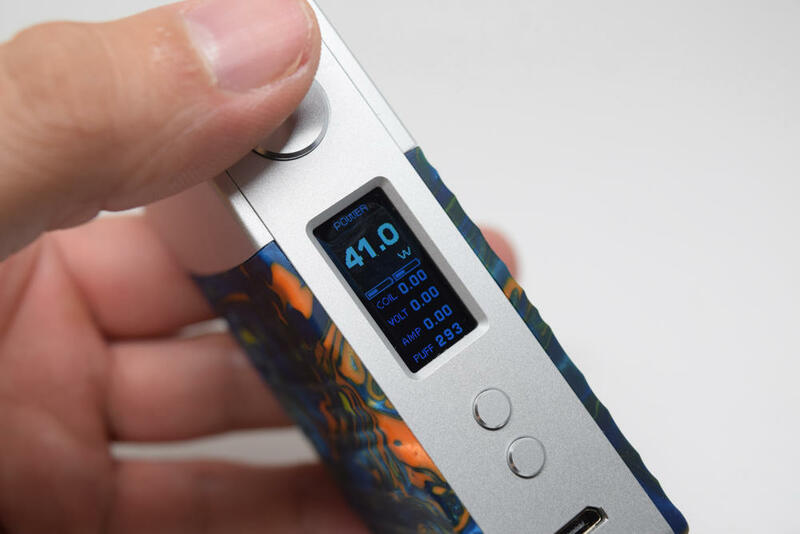 The resin takes up about two thirds of the side panels, with the rest of the mod made of a lightweight aluminum alloy. I know most companies prefer zinc alloy, but aluminum does have its advantages. For example, the Nova weighs just 120 grams without batteries, making it one of the lightest dual-battery mods available. The resin comes in different color combinations and has a wavy texture that not only gives it an interesting look, but also slightly improves your grip on the mod. After careful inspection, I can confirm that the resin panels feel very smooth and have no visible imperfections, which is a big plus. It’s a lot better than the resin on the Wismec Luxotic NC, and even that on the gorgeous Stentorian Basilisk. I will be interesting to see how it will hold up, especially seeing as the resin is exposed on three sides. One thing’s for sure, you definitely don’t want to drop this mod on concrete or asphalt,because the chances of the resin chipping or cracking are very high. It’s important to note that the panels of the GeekVape Nova are not interchangeable. One of them is glued in place and the other is a magnetic battery door. I suppose you could swap the second with a different color one, but I don’t see why anyone would want to do that. 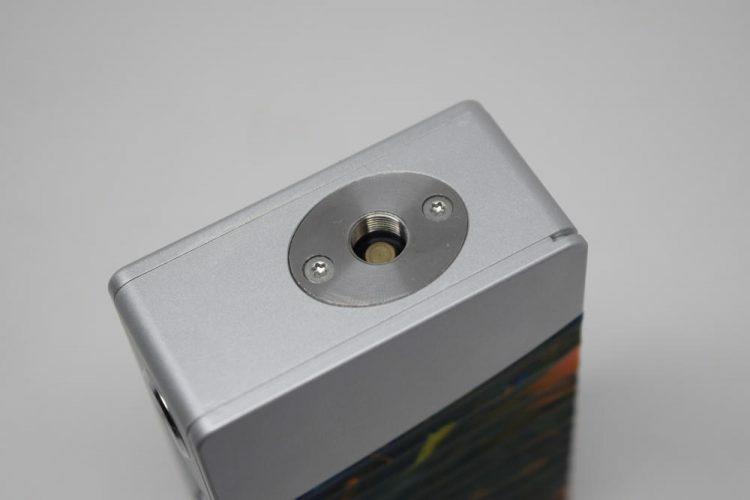 To make it easier to remove the battery door, the mod has a small notch on one of the upper corners. Just insert your fingernail in there and pull the door off. This notch is usually somewhere at the bottom, to make it less visible, but in this case, that would of mean cutting it into the resin, which didn’t make any sense. The battery compartment is very clean, the two battery bays have clear polarity markings and you even have a textile ribbon to make the batteries easier to remove. The magnets do a great job of keeping the door in place at all times, so you don’t have to worry about it accidentally coming off or even wobbling in the hand. The layout of the buttons match the classic look of the mod. We have a large, metallic fire button near the top, a rectangular LCD display, two small ‘+’ and ‘-‘ buttons and a micro-USB port for charging and firmware upgrades. On the bottom, of the mod we usually see venting holes, but in this case, all we have is the ‘Nova’ name and ‘Designed by GeekVape’. That isn’t necessarily a con though, as in case of battery venting, the magnetic door would pop off due to gas build-up. But you don’t even need to worry about that if you take battery safety seriously. All in all, the GeekVape Nova is an interesting-looking vape mod that should appeal most to fans of classic box mods and resin. I’m sure that many would describe its classic design as outdated, but it helps remembering that taste is subjective. Build quality is ok, although the light weight of the aluminum alloy body and resin inserts can feel a bit cheap. It’s not. 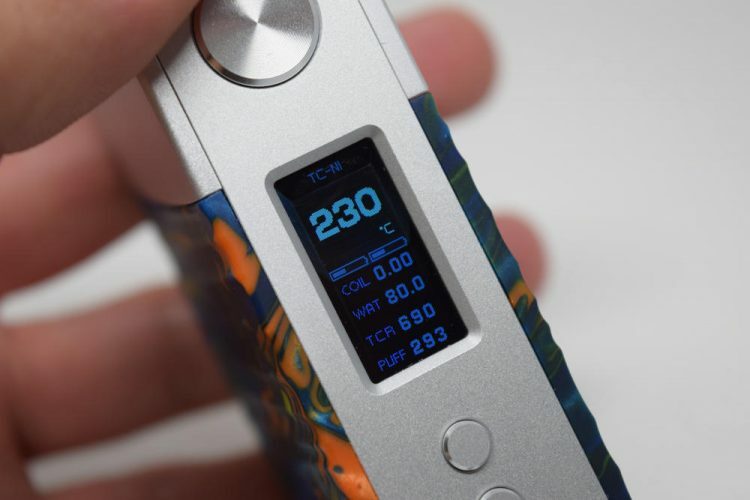 The GeekVape Nova is powered by the same AS Chip that the Chinese company used on the Aegis Legend mod, and it shows. Both mods have the exact same menu layout and navigation system. To turn the GeekVape Nova vape mod on/off , press the fire button five times, in rapid succession. To get into the setting menu, simply press the fire button three times rapidly. Here, you can scroll through the multiple operating modes – Power, Temperature Control (for stainless steel, titanium and nickel), Bypass, TCR and VPC – by pressing the ‘+’ and ‘-‘ buttons. To make your selection keep the fire button pressed for one second. Short pressing the fire button while one of the operating modes is highlighted will allow you to adjust some of the subparameters on the display. The subparameters vary depending on what mode is highlighted, and only some of them can be adjusted. For example, in Power mode, you can only lock the resistance of the atomizer coil and reset the puff counter, while in TCR, you can also set the wattage you want the mod to fire at, as well as the temperature coefficient for your coil material. The VPC mode is just the name GeekVape uses for custom power curve mode. Here you can adjust the power levels for 10 seconds, in 2-second increments, to create a custom vaping experience. You can also lock the ‘+’ and ‘-‘ buttons by pressing them simultaneously for two seconds, and adjust the brightness of the display by pressing the fire button and the ‘+’ or the ‘-‘ button at the same time. All in all, the As Chip menu is very simple and intuitive. Everything is done on the home screen, there are no sub-menus to get lost in, and once you figure out when you have to long-press the fire button, things get very easy. I have yet to review the GeekVape Aegis Legend, but I had seen some complaints on Reddit regarding battery life. 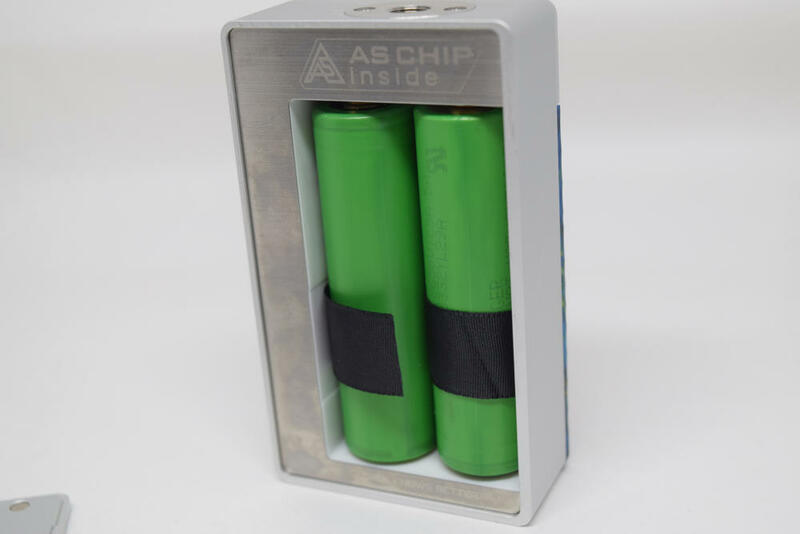 Since the Nova mod uses the same chip, I was worried that it might suffer from the same problem, but, to be honest, I did not notice any notable difference in battery life compared to other dual 18650 battery nods I’ve been using. Either GeekVape updated the chip or the problem was never as serious as those complaints made it out to be. The GeekVape Nova features fast on-board charging, but it’s recommended that you charge the batteries in an external dedicated charger. As far as performance, the awkwardly sounding As Chip – I guess not as bad as VooPoo, though – has so far proven to be very reliable. I’ve had no issues with misfires or any unusual errors, and the firing speed and power ramp up have left me impressed. I’m not sure if this chip is developed in house by GeekVape, or if they’ve teamed up with another company, but it’s definitely a worthy competitor for the likes of VooPoo’s Gene chip or Smoant’s Ant 218 chip. Does it really hit 200W? I have no idea, because I’ve never vaped that high and I don’t plan to either. Like most of the mods I review, I mostly used the Nova 200W mod in Power Mode, simply because this is the operating mode I prefer, and, as I mentioned, so far performance has been very good, but I also played with the VPC mode a bit, as well and temperature control. While I can’t say for sure that the VPC is accurately delivering the power levels set in the menu, because I haven’t measured it, it certainly feels that way when I vape. As for temp.control, I did pop an RDA with dual stainless steel coils on this mod and apart from brown marks on the cotton wicking – which occur with all but the most advanced vape mods out there – it seemed to be controlling the temperature pretty well. The Cerberus sub-ohm tank that comes bundled with the GeekVape Nova is really nothing to write home about. That’s not to say that it’s a bad tank, not at all, it just doesn’t bring anything new to the table. It’s just another 25mm sub-ohm tank the likes of which we’ve already seen before. The Cerberus comes with a very low profile 810 Drip tip that sadly doesn’t match the colors of the mod’s resin panels. It’s just a plain Delrin drip tip, and it feels like a wasted opportunity. GeekVape could have opted for a resin drip tip, like they did on their popular Blitzen RTA, but they chose to go with a bland one instead. The top cap features the same half-turn locking system we’ve seen on some of the Chinese company’s other atomizers, and the top-filling system is made up of two kidney-style slots. The slots could have been a bit wider, to fit thicker juice bottle tips but I’ve had no problem filling the Cerberus with a thick unicorn bottle, so I can’t really give it a con for that. 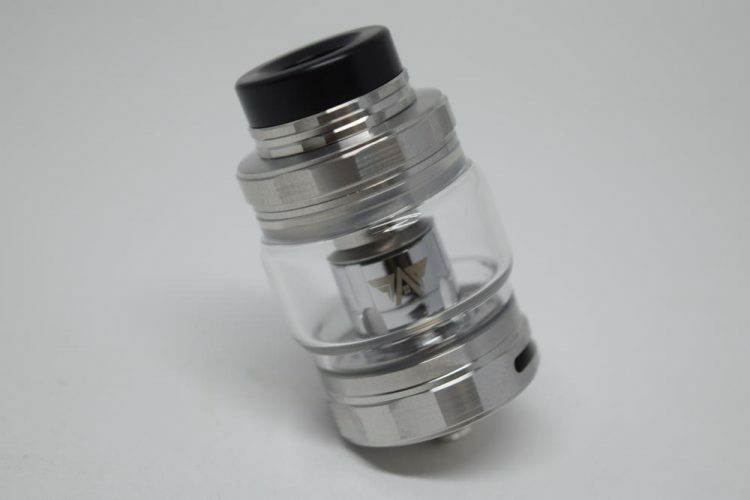 The GeekVape Cerberus has a capacity of 5.5ml with the bubble tank that comes pre-installed, but if you prefer the classic glass instead, the kit does also include a cylindrical glass section. Using that one will bring the juice capacity down to 4ml. Mesh coils are all the rage right now, so it’s no surprise that the Cerberus sub-ohm tank comes with two Kanthal mesh coil-heads that promise to maximize flavors and vapor production. To be honest, the coils perform pretty well, but I was a bit disappointed to notice a difference in taste after only 3 days of juice. I had been using a DIY 80% VG juice with a fair bit of added sweetener, but still, three days didn’t really seem like a lot, considering that I was only refilling the tank once a day. You’ll be happy to know that the Cerberus tank is compatible with SMOK Baby Beast coils, which opens up a wide range of coil options. 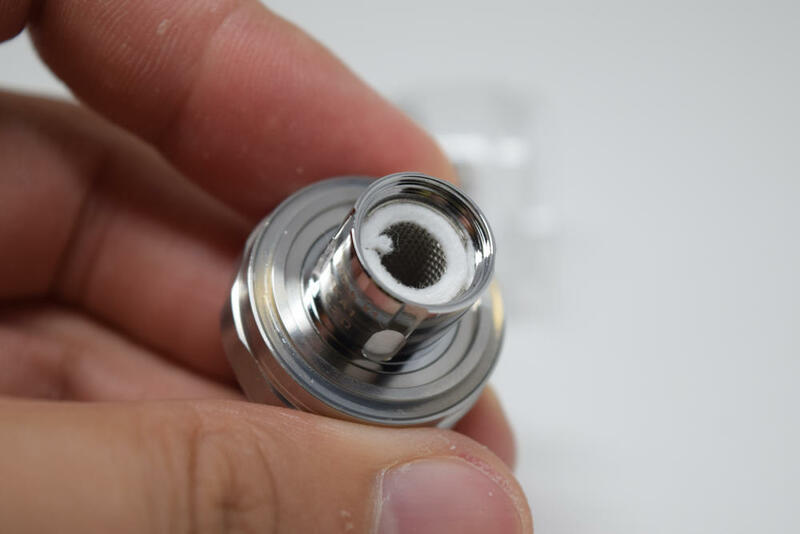 These are probably the most widely used sub-ohm tank in the vaping world right now, so you can find them in various resistances and coil types. Leaking is always a concern with atomizers, but I have yet to experience any such issues with the Cerberus tank. Apart from some minor spitback on the first few draws – likely due to the juice I dripped into the coil to prime the cotton wicking – it’s been dry as a bone. The GeekVape Nova kit offers an interesting-looking mod that should appeal to fans of the classic box mod design, as well as those who appreciate the look and feel of resin inserts, and a sub-ohm tank that doesn’t feature any notable innovations, but delivers pretty good flavor and vapor thanks to the included mesh coil-heads.